I don't even want to admit to you what time I'm writing this post. Suffice it to say, though, that I just got in, and I am 100% sure I will not be awake for Daylight Saving's time at 7am tomorrow morning. Today was laundry day, and I finally got around to washing my duvet cover, sheets, and pillow cases. It's always a pain to strip and then re-make the bed, but when I get to this point in the night, I know slipping into those fresh sheets is going to be so nice. The rest of my day was quite eventful, with an improv show at the Upright Citizens Brigade and a birthday party. To the left you'll find a cool paper head I saw at my friend Eric's apartment. 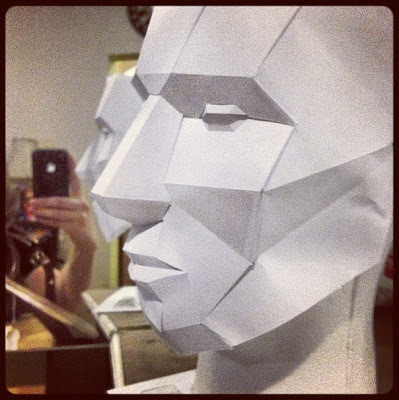 He would be quick to tell you it was paper craft, but still, I'm pretty impressed. Don't worry; he has a girlfriend. I am still a spinster. In any case, after quite an eventful day, this spinster is ready to climb into those fresh, clean sheets that smell of Downy dryer sheets and detergent. I only wish I had had the energy to wash my hair.